There was something undeniably frustrating about putting together this month’s Hall of Shame roundup. 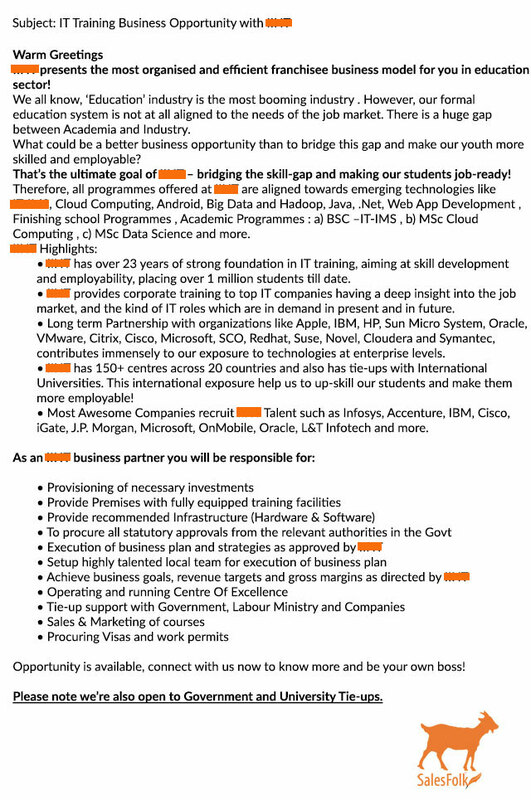 Maybe it was the sheer amount of information to pick through, or the awful formatting choices. How, one can’t help but wonder, do messages like these make it out of draft and into someone’s inbox? People often mistake length for strength in a sales email, cramming as many features as they can into annoying bullet-point lists. Or they go the opposite direction, thinking an extra-general email will appeal to anyone and get more responses. It won’t. And in both cases, a crucial element is missing: the prospective customer and their business needs and wants. You want to know the worst part about a feature list? When the items aren’t even actual features. At quick glance, this looks like just another list of product capabilities (that’s inexplicably written in blue font). Closer inspection reveals it’s actually a list of employee types along with their tenure at the company. I realize the sender refers to these roles as “resources,” and sure, you can, technically, sell resources. But people are not faceless features. Treating them as such in a sales email just suggests you run the digital equivalent of a factory. Conversations builds sales relationships, so make your text conversational. The best way to do this is to read out loud what you’ve written. If your voice drones on like a .matrix printer as you read, you might want to revise a couple times. I can’t decide which of this email’s crimes is more overwhelming: the enormous amount of information or the gratuitous amount of formatting. In the span of one email, the sender covers: automation, stats from a new report, the role of salespeople in the digital age, and the job descriptions of multiple people. Laced throughout is arbitrary bold-faced font and the dreaded bullet-point list. To be fair, they did put a space between the paragraphs and bullet-point lists, which makes this email marginally more readable. With only seconds to keep a reader’s attention, it’s crucial to be as clear as possible about what you want. The formatting issues combined with the numbers, names, and features, this email is just a mess begging to be cleaned up. Its admirable this person wants to “bridge the gap” between Academia and Industry, but they’re not going to do it with an email this long. Sales emails should be all about the other person, not a bullet-point list of your company’s history and accomplishments. Those may boost your credibility, but they’re better left for a phone call or, better yet, an in-person meeting where there’s time to go a little bit off-topic. As far as the list of what I’d be responsible for, it’s more in-depth than most job descriptions on LinkedIn. In other words, it looks like a hell of a lot of work and I don’t want to read about it in a sales email. The goal of any good sales email is to make the recipient’s life easier, not more tiring. Pick a single idea and stick to it throughout, or you’ll wind up burning a lot more bridges than you build. 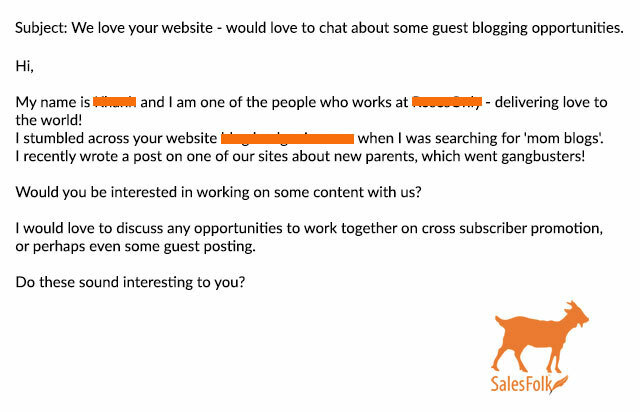 So we have flowers, lead generation, and parenthood in a single email. Combined, what lesson do they offer? That you should check your CRM data and take time to research your contacts before hitting the send button. 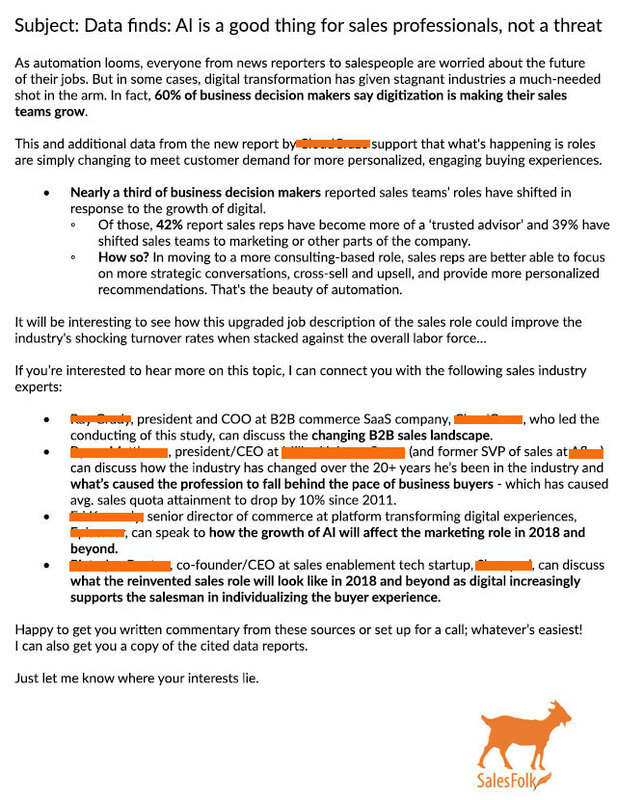 This is one of several emails we received from this company, yet no one at SalesFolk has actually ever talked to the sender. 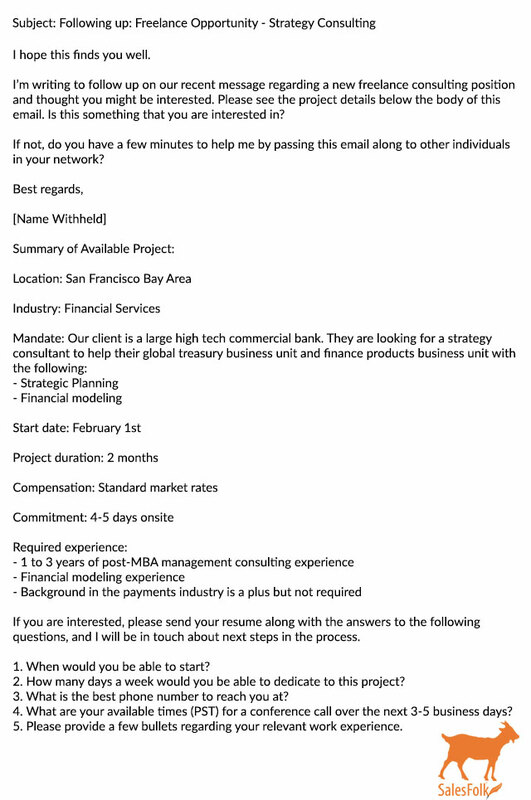 And for an email sent by a stranger, this one asks me to do an awful lot of work: pass the message to someone else if the content’s not relevant to me, answer a bunch of questions, and read through an enormous amount of text. 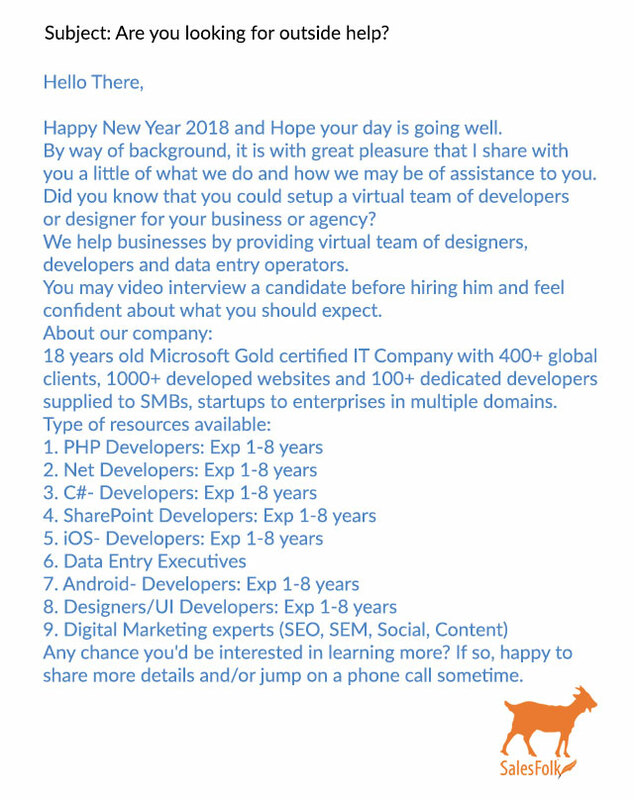 There’s nothing wrong with sending a cold email to gauge someone’s interest in employment, but you won’t get many responses if you post the entire job description in the actual email. For one, it kills any intrigue you might have created by holding some details back. And this much information is really just another form of a feature list. As we’ve discussed, over and over and over this week, features don’t sell, even when you’re the one offering to pay.